« Why I “Rage” Quit. This entry was posted on Wednesday, July 14th, 2010 at 10:19 pm and is filed under Uncategorized. You can follow any responses to this entry through the RSS 2.0 feed. You can leave a response, or trackback from your own site. Well while I can see thats a confusing intersection, I don’t think you handled it properly, from the vid, you seemed to be going pretty fast before you came close to the intersection. If its hard to determine whether you should stop or keep going at an intersection, you should always slow down. Unfortunately your problem in defending against your ticket is thats its really only your word against the video evidence. If I didn’t know your story about the incident, from the video it just looks like your hooning it to beat the traffic lights and unfortunately thats probably how the law sees it and will remain seeing it. Sorry to say i’m doubtful you’d be able to fight this ticket successfully. The video shows me breaking and then letting off the break at the stop line. If I was trying to push the light I wouldn’t have been breaking all the way in like that. Also, my speed was 31mph (according to the ticket). If I were trying to push the light I would have likely been doing 40mph (like most of the other traffic on the road). I’m fairly sure I’ll get out of this one. RCW 46.61.050 states that the traffic control devices must be clearly legible or else the the chapter will not be enforced against the alleged violator. This intersection misuses the signal ahead sign and uses a blinking red light improperly as well. I would consider myself at least ordinarily observant and after showing this to several people they agree that they would probably have done the same thing unless they were familiar with the intersection. Part of what made the stop line invisible is the amount of contrast the shadow of the bridge creates. The entire shadow looks more or less black until you are in it yourself at which point you are already on the stop line. The signal ahead sign gives a false impression that the intersection is further ahead. 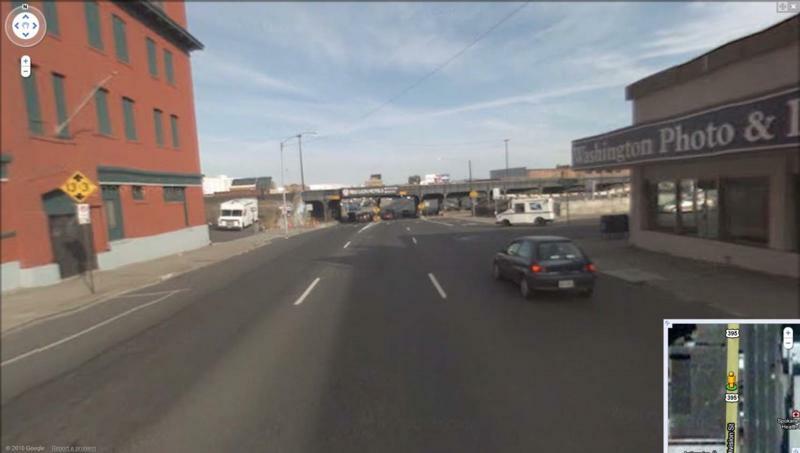 From the angle of the video the existence of the intersection is obvious, but if you were driving down the road you wouldn’t see it until you were already under the bridge. I think it’s definitely strange. If I hadn’t read your description then it wouldn’t have been clear to me exactly what the flashing light was trying to say to me. The fact that they set up a stoplight cam tells me that the whole thing is wacky enough that it’s an ongoing issue, which they decided to profit from rather than fix properly. You might be able to fight it based on that. You might also want to look into deferring the ticket if you haven’t already deferred a ticket in Washington. It would be an easier process than fighting it. I am in the exact same situation now. Had a red light violation ticket at the same spot – I was driving through the intersection for the first time and didn’t see the red light till I was under the bridge due to blocked visibility, contrast, sunshine glare….slammed brakes but had to proceed across the intersection. Were you able to defend your case successfully? I’d appreciate any assistance I get. I sent in a check with my letter, so they cashed the check and never replied to the letter. That was my mistake. I’ll send you an email with the letter I sent them. Feel free to edit it and use it as you please. Don’t send them a check. Even if you have the “appeal” box checked they’ll just cash the check as if you are admitting your guilt.